Another day for writing about the myriad things I care so much about! It is sort of like piecrust, though. Piecrust can be thick, tough, chewy, and in the way of a great pie experience. And I love pie! Allow me to recall the ways. In 1976, after I had gotten my discharge from the Marine Corps and had been admitted to the University of Montana, we drove the rented truck and two Volkswagens from Southern California to Missoula. I checked in at the student housing office at Elrod Hall and got a key to 215 B Sisson apartment. I took the five of us and everything we owned to the southernmost “X,” and soon P said to me that she had just met the woman who lived on the first floor and that they were going to be best friends. It was true! Marilyn Seastone had three children, same as we did. The Charles and Marilyn were about the best neighbors anyone could have. They were endlessly funny and fun, completely intellectual, completely poor, completely making do with next to nothing, perfectly elegant in their simplicity. In short, they were outrageous! All of their friends were the same way. How I gush. No. The Seastones were not perfect. They had their share of darkness and troubles, same as we did. Ended up we were not speaking to each other, but I did help them move out about five years after we had met in 1976. Doesn’t that happen when you become intimate friends, one family with another? The next year after we moved to Missoula a few friends and I started a magazine when I took a summer journalism class from Wilbur Wood. The magazine, “The Portable Wall,” was my project and the fulfillment of a desire. Dana Graham, my brother’s ex, got to name the periodical by donating $10 toward its premier issue. 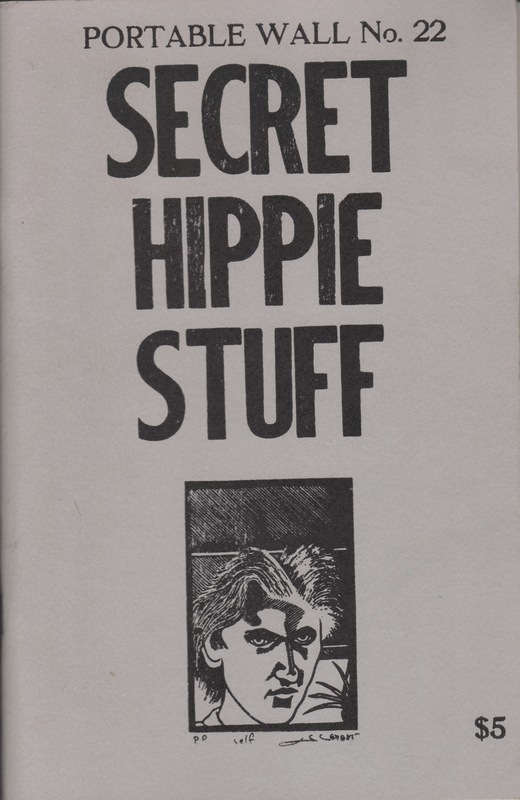 I find it interesting that all of us: Dana, the Seastones, Mark Fryberger, Dirk Lee, were really hippies in whatever manner could be construed to be real at the time. I don’t remember smoking any marijuana when we made the magazine! I do recall working on a Volkswagen when a black student with some friends came by, who saw me smoking a tobacco hand-rolled cigarette, offered to “squeeze” it for me. I think I offered him a hit, but he had little interest in squeezing my tobacco cigarette. My initial pie-making effort happened the next year in the Fall, and I chronicled it in the third issue of The PW. I tried to make a 7-inch crust fit a 9-inch pie pan. Really didn’t work. I did the calculations later, to find that it takes almost twice as much dough for that extra 2 inches of pan! I also discovered that pie dough sticks to the surface of a table if one is not careful. I scraped the dough off the table several times, that Fall day in 1968. I also discovered that if one works the dough often enough, the gluten comes alive and grabs each other’s molecules in tight embrace, to toughen and strengthen the ball so that tons of force would (theoretically) be required to render the ball into a very thin piecrust. The theoretically thin crust is only that. Impossible. The result, in reality, was the person (me) suffering humiliation and weeping. This was one of only three times I shed tears as an adult. I think I lied in my PW article about pies, claiming to make a pumpkin pie that was edible. Well, the custard itself was edible, but the crust had to be thrown out, mostly uneaten. One could eat it, again theoretically, but such eating was not pleasant, nor particularly healthy. I learned a great deal from my Sisson Apartments pie effort. I learned to respect, but not fear, pie crust. I learned that pie crust is a necessary evil, like the words used when writing. My dear spouse still declines most crust. She rarely fails to tell me her feelings about crust. I usually say, “I know, I know,” when she launches into her speech, asking me to consider making a cobbler instead of a pie. My pie making made a huge leap when we started working summers at the fire lookout tower in Northwestern Washington at the Priest Lake Ranger District. I could pick a pie’s worth of huckleberries while making my way uphill to the tower from the spring where I collected 4 gallons of water. Sometimes I’d make batches of 7 pies a day. My fate as a pie maker was sealed. In later years our aunt Corinne brought huckleberries and whiskey to our house at winter holiday time. She taught me to make lefse. She taught me to boil 5 large potatoes, skin them, add cream, butter and flour and salt. She took a ball of dough smaller than an egg and rolled it larger than a manhole cover. What a rare treat. What a treat to be lambasted by my dear aunt. “Go to hell!” she said, if I failed to run for her whiskey. She was my uncle Bud’s sister. These days I know where to find huckleberries and good apples, even decent pumpkin for pies. As my life forces ebb I know how to concoct pies that are attractive to our three children and our seven grandchildren. Keeps us in touch over the holidays. Pie crust? A necessary evil, just like the words used to write such as this. A cover from The Portable Wall. Illustration by Dirk Lee. « Story of my life….